Through communities in the Philippines, Samaritan's Purse blue tarps can be seen on rebuilt structures. Rebekah Price is the information officer for Samaritan’s Purse in the Philippines. The sun was shining, but dark clouds hung in the sky as we bounced down the road to Atipolo. As is typical when traveling to communities in the Philippines outside of larger cities, the road alternated between concrete and gravel, with many areas suffering from washout. Through rice fields and out into an area spotted with palm trees, bamboo, and other vegetation, we carried on until we reached Atipolo, where we would speak with recipients of shelter kits that Samaritan’s Purse had been distributing in the months since Typhoon Haiyan. The typhoon destroyed Rosario’s house. They were able to rebuild with the help of Samaritan’s Purse. As soon as I stepped out of the air-conditioned truck, I was struck by the heat and thick humidity. Entering the community, we walked past what was left of the barangay hall. Each community, called a barangay, has a multipurpose hall, usually adjacent to a basketball court. Months after Haiyan, this one was still unrepaired and missing a large portion of its roof. I took in the atmosphere as we ventured into the community. Chickens and dogs roamed freely amongst predominately wood structured homes. Samaritan’s Purse blue tarps stood out brightly amidst the mix of materials used in the rebuilding process. At one rebuilt house, we met Rosario. Before the typhoon, many barangays received warnings and urges to evacuate, but Rosario only heard this news from her son living in Manila. When she realized they needed stronger protection, she and her younger children took shelter with other families in a block house nearby. Many in the community took shelter in the school. Schools often serve as the evacuation centers, but it was unable to hold everyone. With an unexpected storm surge, it was also unable to protect everyone. Meanwhile, her husband and one of her older children were out working in a field. The weather was deceivingly calm before the typhoon, which fed people’s misbelief that it was not a serious threat. Desperate for some kind of shelter when Haiyan hit, they climbed a mango tree. Rosario thought that her husband and child were dead as the storm raged on. 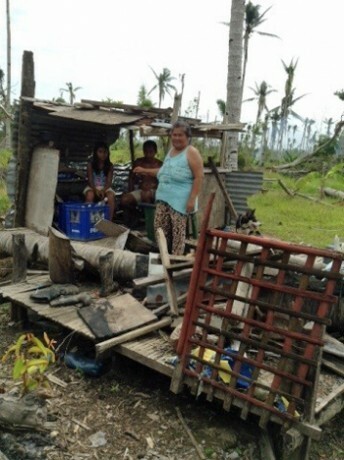 When the storm subsided, Rosario and her children returned to where their house had been only to find a pile of debris. The home had been torn apart, but she was thankful that her family had all survived, including her husband and child who had been outside. They pieced together what they could for shelter until they received rebuilding materials from Samaritan’s Purse. Rosario was thankful that her entire family survived the storm. After receiving a shelter kit from Samaritan’s Purse, they also received a Bible. She now attends a Bible study in her community. Following the distribution of shelter kits, a team from Samaritan’s Purse came to encourage and pray for them and to give them a Bible. 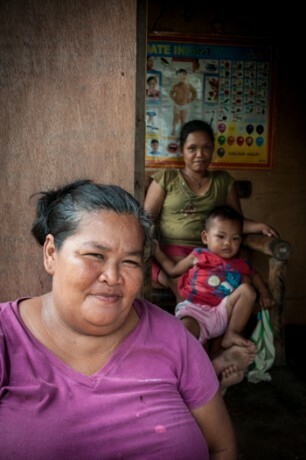 The typhoon proved Rosario’s home couldn’t provide her with protection from the storm. But now, she trusts God for shelter. As she spoke, rain started falling from those dark clouds that I had noticed earlier, but the sun still shone. It seemed like an illustration of her story. While there was sorrow and struggle like the rain falling, there was still hope and trust shining through in a God that is greater than the storm. Before leaving, we prayed with Rosario, and our leader on this visit shared Psalm 27:5: “For in the time of trouble He shall hide me in His pavilion; In the secret place of His tabernacle He shall hide me; He shall set me high upon a rock,” (NKJV). In a community devastated by loss, hope remains and faith grows. Each week Rosario joins with other members of her community in a Bible study that has started since Samaritan’s Purse distributed Bibles in her community. She is learning from the truth of God’s Word and connecting with neighbors. Through everything that she has experienced, Rosario said she still believes that God is good. I left Atipolo that day humbled by Rosario’s story. I pray that through her Bible study group and the others that have begun in affected communities since the typhoon, God will bring healing and continued strength to those seeking shelter in the Lord.